The most popular plug-in hybrid is the Chevrolet Volt, isnt’ it? This is what most people believe, and it’s quite true that there are more Volt cars driving the planet than any other plug-in hybrid but for the first months of the year, the BYD Qin in China has been vastly outselling the Volt in the US. This car has been raising many eyebrows in the western world since its launch. Its 290 hp gas-electric powertrain promises great performance with a 0-to-60 mph in less than 6 seconds, but the most surprising is that BYD is in no hurry to bring it to the rich U.S. or European markets. The first export market for the Qin was Costa Rica, and selling the car in other countries is probably delayed as BYD just said it has trouble meeting demand in China. Big demand even if, like most Chinese car manufacturers, BYD is unable to say how many cars it sells each month. It only says that “in the first weeks of 2014, more than 6,000 vehicles were sold”. Quite a figure, even if the Chinese auto market is the largest in the world. 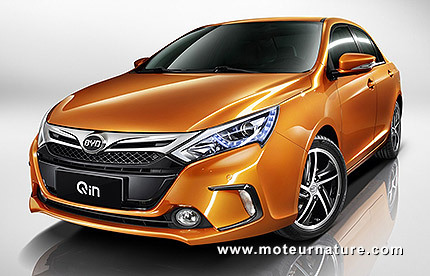 As the BYD Qin is still very new on the market, it remains to be seen if this initial success will last, but people shall get ready to the idea that the best-selling plug-in hybrid in the world may be Chinese.